The Canon 5D Mark III has been released at last. The new DSLR follows on from Canon's popular EOS 5D Mark II, which is now over two years old. Rumours of a new full-frame Canon have been circulating for some time, with some speculating that the DSLR would be called the Canon 6D, and others betting it would be the 5D Mark III. Our Canon rumours article has certainly been updated several times while we tracked this hot new release. The upgrade features a 22.3 million pixel sensor, 61 point autofocusing and 6fps continuous shooting. Set to rival the Nikon D800, the 5D Mark III also features Canon's recently announced Digic 5+ image processor which promises fast shooting speeds and helps to reduce noise. Sensitivity ranges from ISO 100 - ISO 25600, which is expandable up to 51,200 in H1 mode and up to 102,400 in H2 mode. It is also expandable down to ISO 50. Naturally, the camera shoots full HD video and a headphone socket allows sound to be monitored accurately. Autofocus operation has been dramatically improved on the camera, which now features 61 high density reticular AF points with up to 41 crosstype points. Fast shooting is available at up to 6 frames per second, while an intelligent viewfinder allows for approximately 100% coverage. According to Canon, the camera has been tested to a shutter durability of 150,000 cycles. Dual card slots have been included on the camera, with one for Compact Flash and the other for SD. It seems that Canon has so far rejected the new XQD memory card format that is utilised by the Nikon D4. The camera is also capable of creating multiple exposures and high dynamic range images (HDR) in camera, while a comparative playback function allows images to be checked against each other. Improved durability comes in the shape of water and dust resistance which has been upgraded for the new model. Like the EOS-1DX, the EOS 5D Mark III has a 3.2in 1,040k-dot Clear View II LCD with a gapless design to reduce reflections. 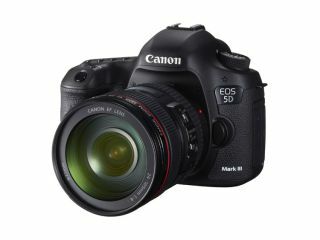 The Canon EOS 5D Mark III UK price is £2999.99, while it is expected to be available from the end of March.